Today is the 15th day of the Chinese New Year, or Chap Goh Meh. In the old days young maidens would take a walk under the full moon and cast oranges into the river to wish for a good husband. Or something like that, more or less. Anyway, as the celebration comes to and end, I would like to share something from my mother's kitchen. Unlike my little kitchen, hers is large and airy, with plenty of natural light, which is perfect for food photography. I helped my mom make meat rolls for CNY dinner. 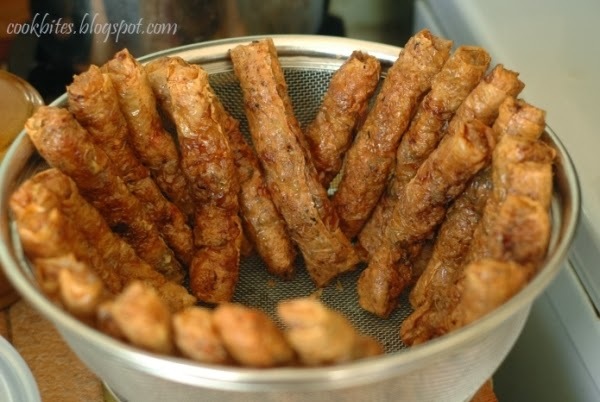 They are either called Lor Bak or Ngo Hiang in Chinese. I'm not sure if there is a difference, but one thing I'm sure off, these meat rolls are yummy! Unfortunately, they take a bit of work. But it's okay, it's a labour of love for the family! This is me, chopping up some stuff. The things that go into the meat rolls are carrots, water chestnuts, shitake mushrooms, crab meat and pork meat. Here's the meat filling all ready to be rolled. 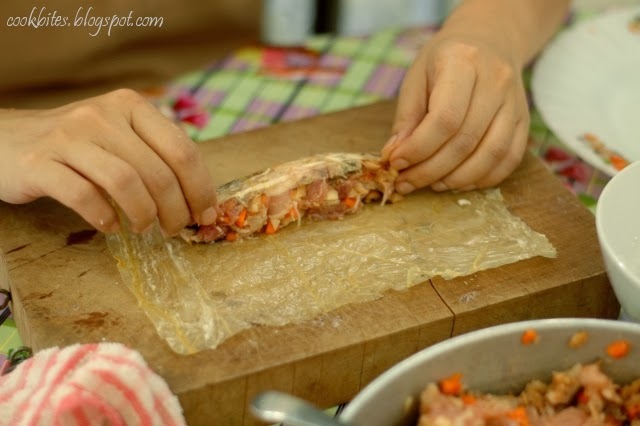 The filling gets spread onto a bean curd sheet, rolled up, and sealed with cornflour mix. 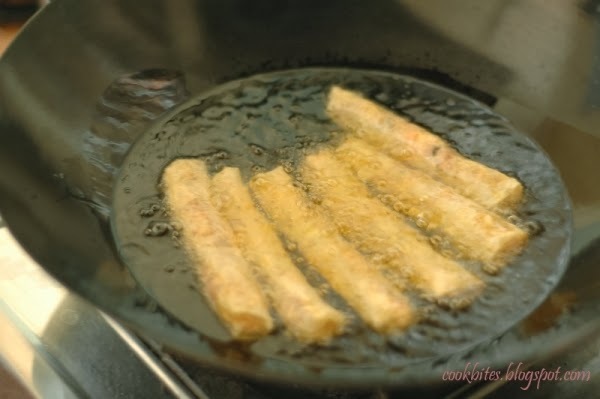 These are the meat rolls, frying in in hot oil. And here they are..... hot Lor Bak, ready to be cut and served! We also had other food, which I'm not showing here. 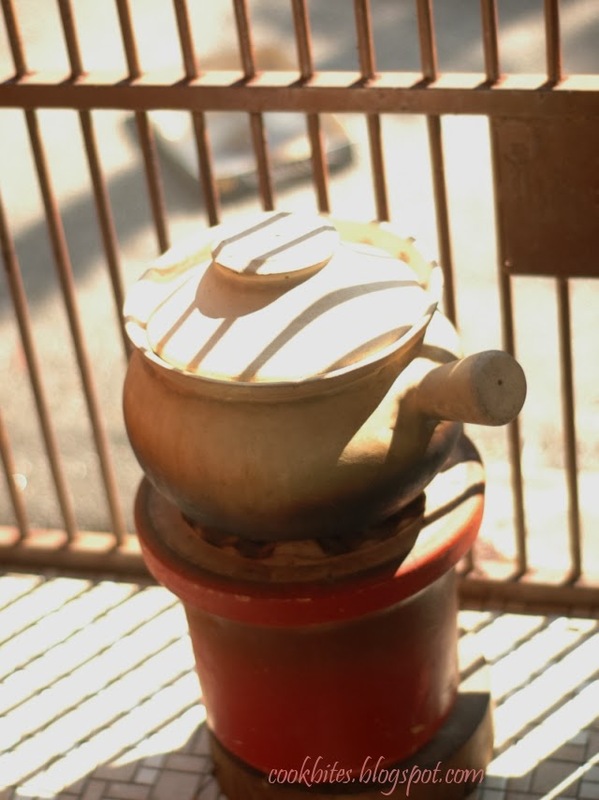 But take a look at this claypot on charcoal fire. Duck soup simmering inside. That's all for now. Happy Chap Goh Meh and Happy Valentine's Day everyone!